Versele-Laga and Loro Parque Fundación have agreed to extend and enhance their cooperation. That was announced during the International Parrot Convention in Puerto de la Cruz, Tenerife. More than 16 years ago, they joined forces, with a shared vision of nature conservation as starting point. Meanwhile, the connection between the non-profit association and the manufacturer of premium bird food is stronger than ever. The Loro Parque Fundación cooperates with the famed Loro Parque animal and parrot wildlife park on Tenerife. The park houses the world’s largest parrot and parakeet collection and was recently voted the best zoo in the world by TripAdvisor. They both have as mission to protect the animals and their natural habitat and to preserve it for future generations, in order to bring people closer to nature again. In 2002, Versele-Laga and Loro Parque Fundación found eachother thanks to that shared vision of nature conservation. Through this partnership, the Loro Parque Fundación is able to rely on the needed financial resources to carry out its mission of actively helping to preserve endangered parrot species. This is expressed, for example, in educational programmes, sponsorship of various research projects and an own breeding station “La Vera”. The knowledge in terms of nutrition gained during these projects, is brought to the open market through the Prestige Premium mixtures of Versele-Laga. In this way, every bird lover can enjoy the developped expertise in terms of nutrition and support the Loro Parque Fundación at the same time. Thanks to this foundation, nine parrot species have already been saved from extinction, while for many other species the population in the wild has improved. 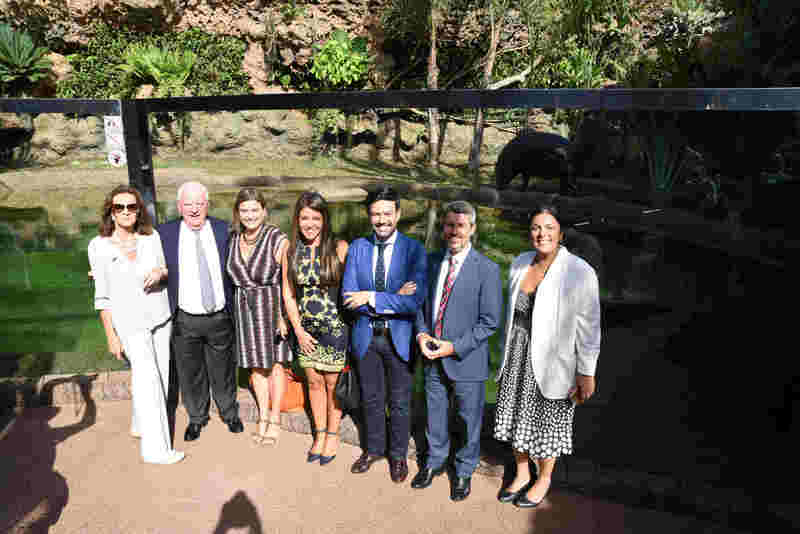 After 16 years of constructive cooperation, the connection between Loro Parque Fundación and Versele-Laga is stronger than ever. 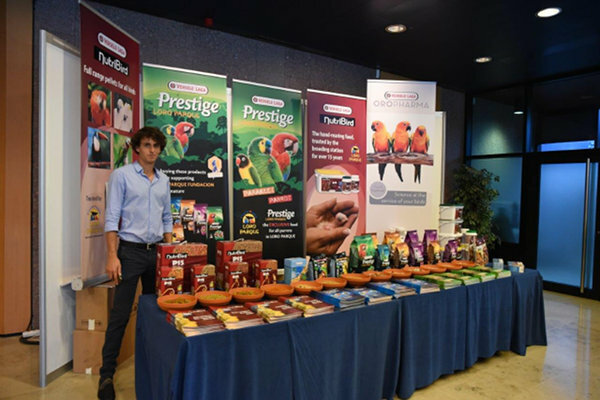 In the build-up to the ninth edition of the International Parrot Convention, it was also decided that the cooperation will be extended and furter developped in terms of nutritional studies, knowledge exchange and developments. This will result in an even beter protection and preservation of these unique birds. The great hall of the Auditorio de Tenerife bore witness yesterday afternoon, Wednesday September 26, to the presentation of the prestigious Gorilla Award 2017 to Rosemary Low, a passionate defender of parrots who has dedicated her life to these birds through breeding and conservation. This year celebrates the fifteenth edition of this award, which emphasises environmental responsibility, addressing strategies and actions to conserve biodiversity and promote the sustainable use of resources. 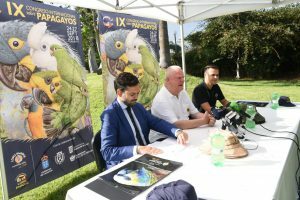 The event, which was held within the framework of the IX International Parrot Congress organised every four years by the Loro Parque Foundation, welcomed more than a thousand guests. 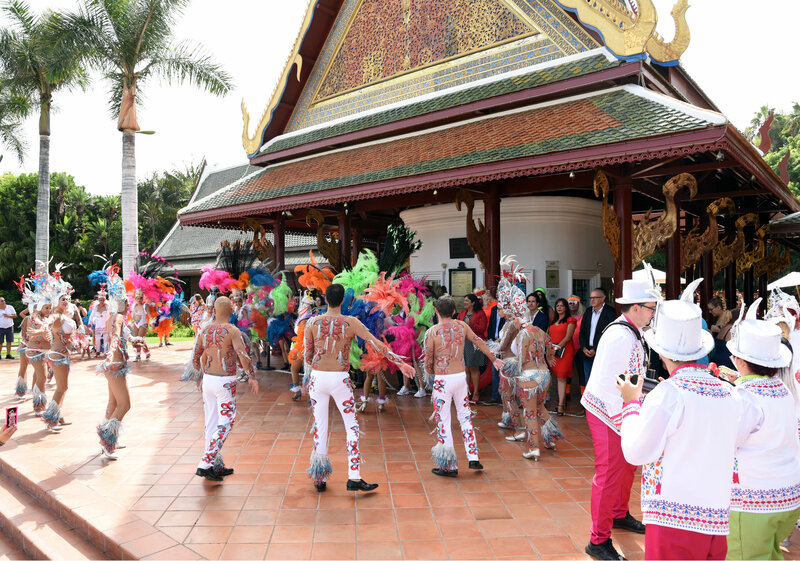 Numerous authorities, civil, military, consular and private sector representatives accompanied the hundreds of congress attendees, of more than 40 nationalities, who are visiting the island this week attracted by this world famous convention. Wolfgang Kiessling, President of the Loro Parque Company, wanted to highlight the work of Rosemary Low, who for years was a Bird Curator at the Parque, and who has dedicated her entire life to the breeding and conservation of parrot species. Her principles and values, Kiessling emphasised, are the same that move Loro Parque, prioritising the protection of nature at a time when the human population is growing exponentially and, consequently, the resources and habitats of wild animals become more limited and are in worse conditions. 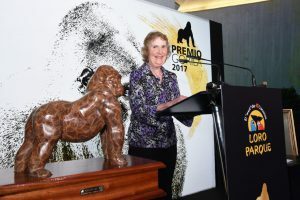 For her part, Rosemary Low highlighted Loro Parque Foundation’s conservation achievements in a speech that recalled her first visit, in 1984, and her more than 30 years of relationship with a Parque to which she has a special affection. “It has been a privilege to be involved with Loro Parque and the Foundation for so long,” she said. Rosemary Low is a prolific writer, and her numerous articles and books have been translated into many languages. She was the first to publish a book on parrot conservation. This book, called Endangered Parrots, was first published in 1984, and a revised version was published in 1994. She is currently working on a more complete version that will bear the name Parrot Conservation: A view across four Decades. Rosemary has visited 29 countries, many in South America, to observe parrots in the wild. There she has been involved in conservation projects, about which she has written extensively and for which she has been invited to numerous conferences in Europe, Australia, the USA and Brazil. She is a tireless fighter for parrot conservation. Since she raised money for the Imperial Amazon during the first International Parrot Congress in 1986, she has been involved in numerous parrot conservation projects for which she raises funds. She has owned parrots since 1958 and tends to say “We are privileged to be able to enjoy these sensitive, impressive, beautiful and intelligent creatures”. We can share these feelings of hers in her most recent book Understanding Parrots – Cues from Nature. Her long experience and profound knowledge have made her an icon in the field of parrot breeding. Nothing matters more to us than the health and wellbeing of the animals in our care. As we updated earlier this week, a team of veterinarians and external consultants has been monitoring the progress of Morgan and her calf around the clock since birth. The primary focus during these crucial first days has been ensuring the calf is getting all the nourishment it needs. While natural breastfeeding is always the preferred option, Morgan’s milk production has been below what is needed in these first few days. Therefore, the veterinary team has assisted by temporarily bottle feeding the calf while giving Morgan the chance to increase her milk supply. We are glad to say that mother and calf have now resumed natural breastfeeding and the experts are pleased with the strong bond the pair have developed. With the help of our state-of-the-art facilities and assistance from world-leading experts, the team continues to closely observe the situation to ensure that Morgan and her baby establish a good, healthy and natural feeding routine. However, we are, of course, ready to step in to help if there is the slightest concern that the calf’s nutritional needs are not being met. We wish to thank everyone who has been in contact with us in these past few days and have been touched by the many messages of support. We will keep you posted with all the latest information as things unfold. 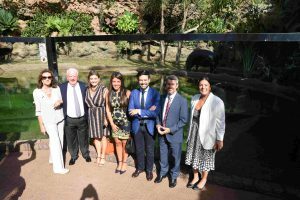 Loro Parque has inaugurated today, Tuesday September 25, the new facilities for the Pygmy Hippos, in an act that was attended by the President of Loro Parque Wolfgang Kiessling, Tenerife’s Tourism Councillor Alberto Bernabé, and the Mayor of Puerto de La Cruz Lope Afonso, among other authorities. These new members of the Parque’s family, two females arriving directly from Germany and the Czech Republic, now live together in a naturalised facility specially designed for them. 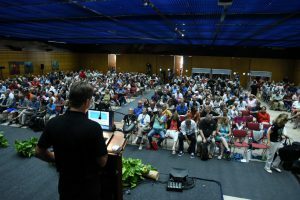 Nearly a thousand people, including political and civil authorities and representatives of the business sector, as well as attendees of the IX Parrot Congress organised by the Loro Parque Foundation, which takes place this week and has hosted on the island more than 800 participants from over 40 different nationalities, have been able to contemplate this new exhibition in which Adela and Malela, as the Hippos are called, act as representatives of their fellows in nature, who face serious problems, especially the destruction of their habitat. Loro Parque has designed an unparalleled naturalised space for the newcomer Pygmy Hippos, whose new home is perfectly adapted to the needs of their species. The installation has floor heating and a complete water filtration system, an essential element for these animals, who need to keep their bodies hydrated and at an adequate temperature. Thus, the exhibition recreates a marshy, humid and leafy area, similar to the dense African lowland forests of which this species is native, and which usually always live around the banks of a river. Visitors to the Park can now observe their daily activity in detail thanks to a large window that shows these charismatic hippos in their maximum splendour. Although this species is characterised by its shyness and nocturnal habits, the design of the facility allows us to know them better and become more aware of the need to protect them. As an endangered species according to the International Union for the Conservation of Nature (IUCN), the role of wildlife conservation centres such as Loro Parque is essential to make their situation visible and to make visitors aware of the importance of protecting them to avoid their disappearance. So, after the grand opening of the Zen Garden just a few months ago – a submerged garden unique on the planet – and after receiving the recent recognition of TripAdvisor as the best zoo in the world for the second year in a row, Loro Parque is once again bringing new surprises for those who appreciate its great commitment to wildlife in all its beauty and diversity. Loro Parque Foundation’s IX International Parrot Congress of Loro Parque Fundación was presented this morning, Tuesday, September 25, at Puerto de La Cruz’s Congress Centre. 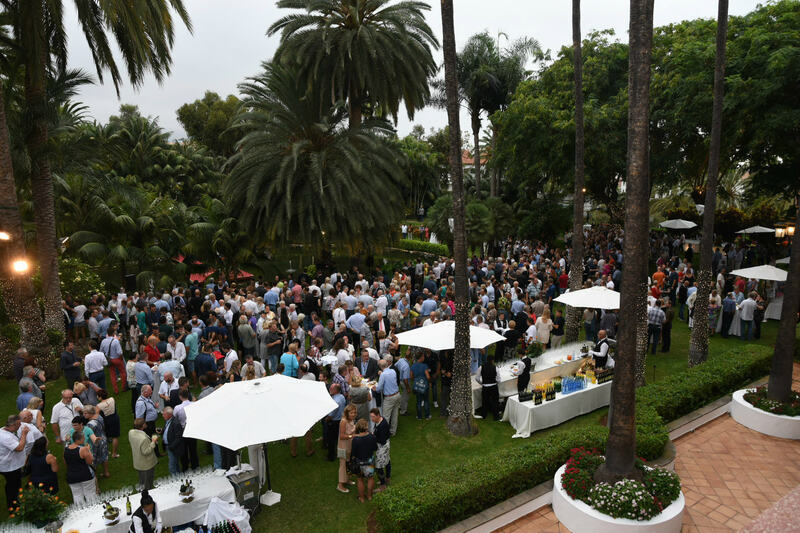 The event, unique in the world, has attracted to the island some 800 participants of 47 different nationalities, and celebrated its opening last night in the wonderful facilities of the Hotel Botánico. 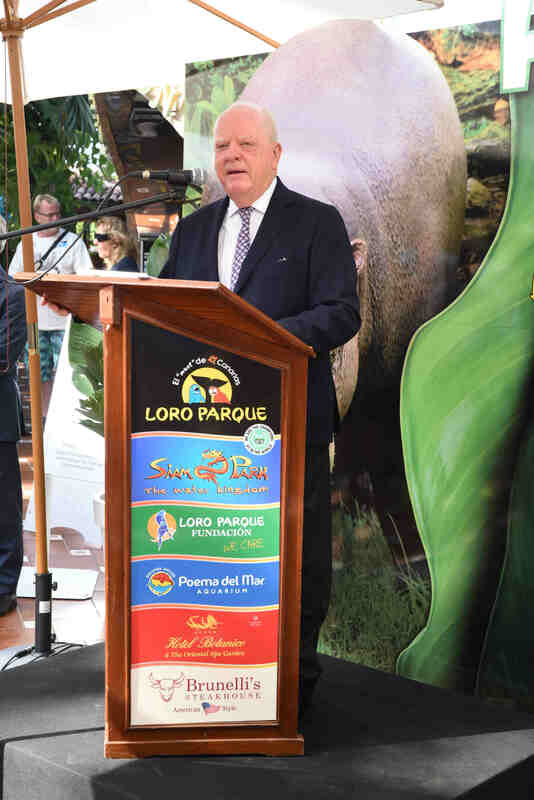 The press conference was attended by the Mayor of Puerto de La Cruz, Lope Afonso Hernández, the President of the Loro Parque Company, Wolfgang Kiessling, and the Scientific Director of Loro Parque Foundation, Rafael Zamora. 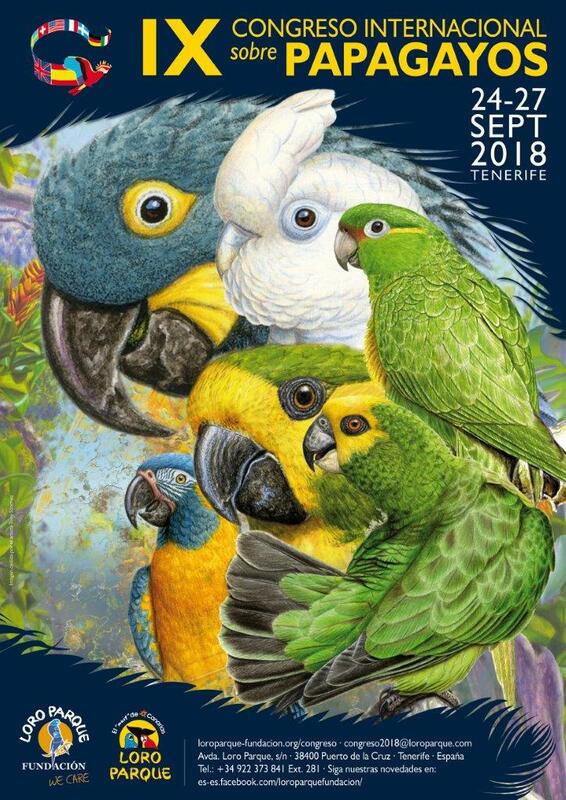 Firstly, the President of the Loro Parque Company wanted to highlight the importance of an event such as the International Parrot Congress, which is held every four years and brings together in Puerto de La Cruz the most important experts in the field worldwide, in a unique environment. 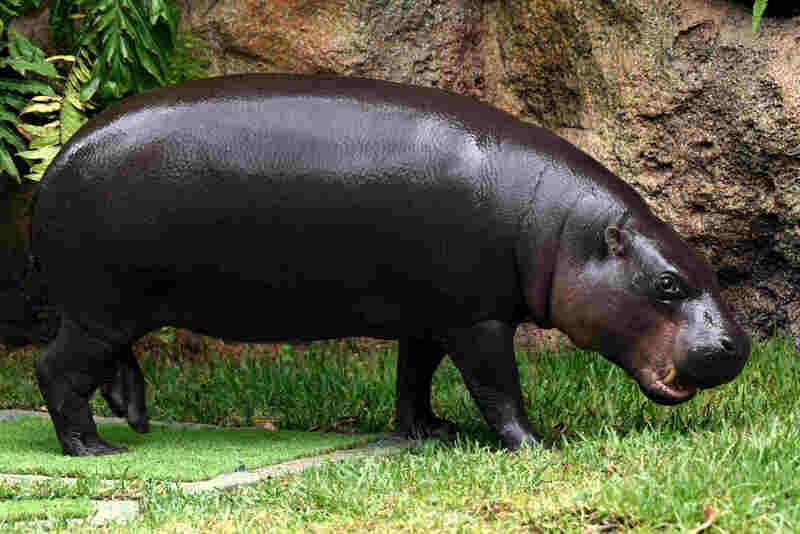 He also took the opportunity to review the latest developments in the Parque, such as the new installation for the Pygmy Hippos, which was inaugurated this afternoon, and highlighting the Company’s ongoing commitment to nature, using as an example the strategy for the elimination of single-use plastic in their installations, which is already in its final phase. For his part, the Mayor of Puerto highlighted how Loro Parque has been able to organise the largest congress of the decade, bringing together a large number of people who will be enjoying the scientific interchange, but also the city, the Hotel Botánico, and of course, the rest of the Islands. 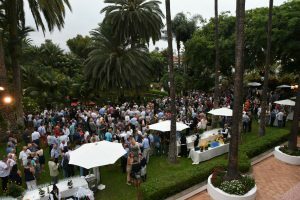 In addition, he pointed out that it’s another opportunity to put the name of Puerto de La Cruz in the forefront of the minds of people in the five continents from which the congress attendees come. 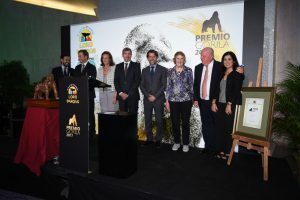 Finally, the Foundation’s Scientific Director, Rafael Zamora, assured that among the topics that will be dealt with in the Congress are animal welfare, parrot conservation – a very important part of the Loro Parque Foundation, which has been working for years with recognised successes – and the maintenance of birds in a controlled environment. Zamora also stressed that this is a unique event, bringing together more than 1,000 people in a tourism that looks to protect nature. In this edition, and in response to an unprecedented demand, intensive workshops will be given during the three days following the Congress, in which different experts will offer direct training in different fields linked to the world of conservation. 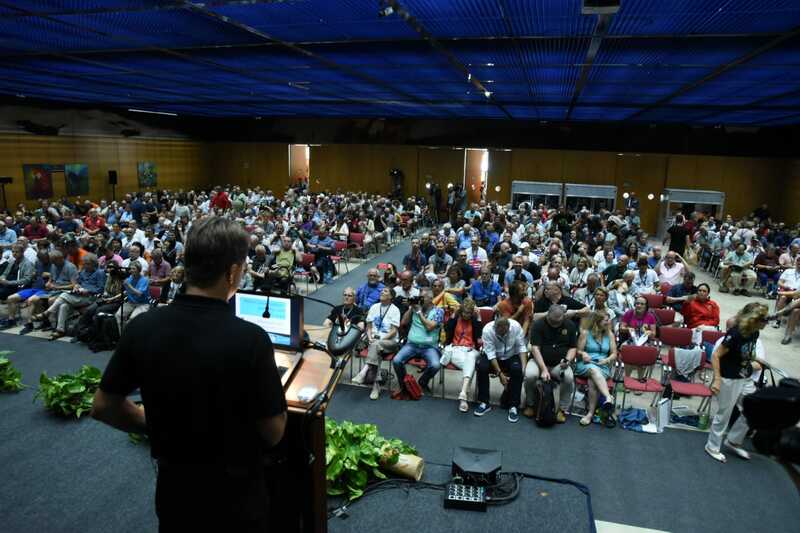 Since the first edition was held in 1986, the Loro Parque Foundation Parrot Congress brings together a multitude of scientists, biologists and conservation and veterinary medicine professionals in general, as well as students from different parts of the world. As usual, the line-up of speakers in this edition also brings together experts from the most diverse corners of the planet. The Congress will also feature an original ‘wining & dining’ leisure programme that will allow attendees to visit emblematic places on the island while enjoying different parallel activities. 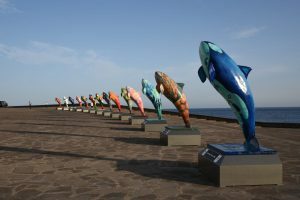 In addition, for the first time this year, an excursion has been organised to Gran Canaria to visit Poema del Mar, where participants will enjoy the impressive marine life in an incomparable setting. Also in this edition, and in response to an unprecedented demand, intensive workshops will be given during the three days following the Congress, in which different experts will offer direct training in different fields linked to the world of conservation. These types of activities generate a very positive impact for the Islands, because they attract a tourism that appreciates nature and seeks to know the different attractions of the archipelago, extending their holidays to do so. September is also one of the most spectacular months in the Canary Islands, with long sunny days, dreamy sunsets and beaches that invite long walks. 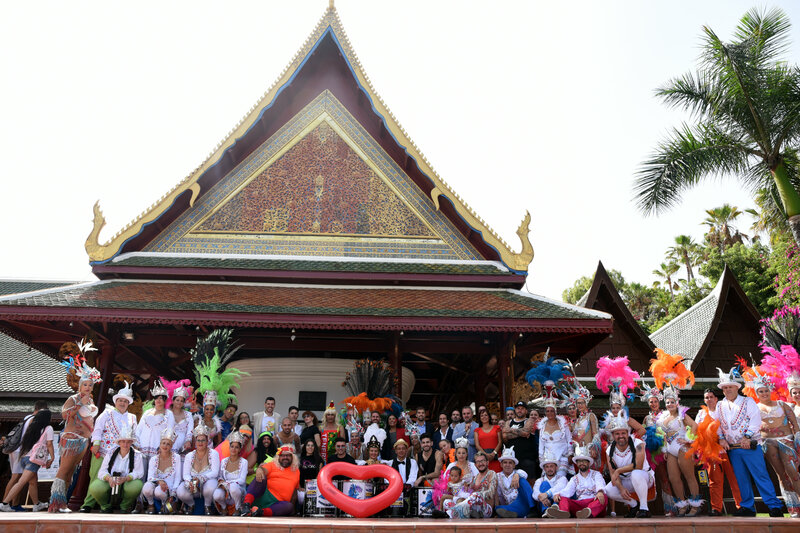 The IX Parrot Congress will undoubtedly be a unique opportunity to share, learn and enjoy in an unequalled environment. Those interested in applying for press passes can now do so by sending an email to dir.comunicacion@loroparque.com. The presentation of Puerto de La Cruz’s Summer Carnival, held today, Friday September 14, in Loro Parque, has launched a weekend in which the protagonists will be the comparsas (dance groups), batucadas (drum groups), orchestras, parades and street parties, amongst other activities. This is already the third year of this initiative, which, following the success of previous years, will fill the streets with music and colour to become once more a cultural and tourist attraction in the municipality. The event held in Loro Parque, which was recently recognised as the best zoo in the world for the second consecutive year according to TripAdvisor, was honoured with a great performance by the Rio Orinoco comparsa, which infused everyone present with its rhythm and carnival movement. The inaugural act, full of colour, joy and life, was attended by the Councillors for the areas of Festivals and Tourism Ruymán García and Dimple Melwani, the Commercial Director of Loro Parque Jorge Vega, the Director of Communication of the Compañía Cervecera de Canarias (Cerveza Dorada) Luis Durango, and the French artist with a Canarian accent Poupie, who conquered all of Spain after her passage through the Telecinco contest Factor X. 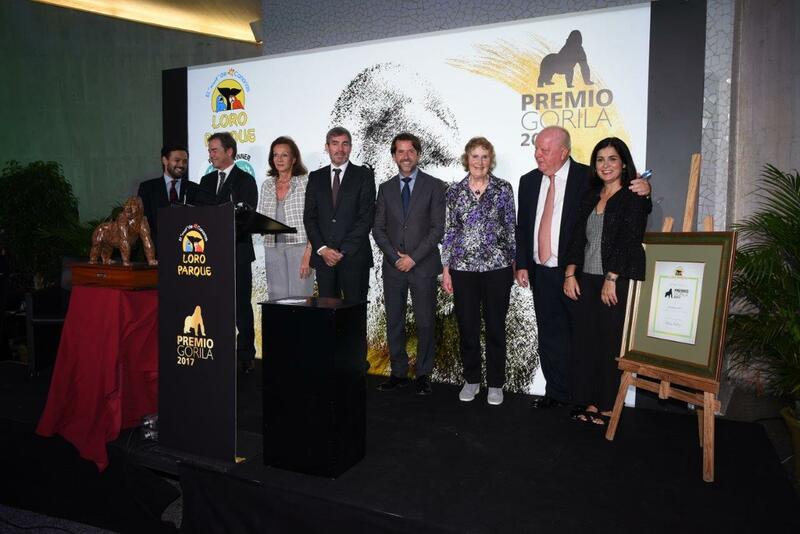 In the first place, the Commercial Director of Loro Parque assured those present that it already seems as much a tradition to receive the title of best zoo in the world as to celebrate the Summer Carnival. In addition, he insisted that this festivity represents a great joy not only for the residents of Puerto de la Cruz, but for all tourists who have the opportunity to enjoy it. For his part, the head of Festivities Ruymán García, presented the official poster of the Carnival of Puerto de la Cruz 2019, made by the artist Jonás Emanuel, which will be called ‘Invasión Carnavalera’ (Carnival Invasion). Also, García ran through the entire programme established for these three days of celebration, highlighting the performance of Poupie. In addition, he insisted that “it’s a summer season in which we can boast of a carnival that each year has been more successful. The Councillor for Tourism Dimple Melwani, also thanked the Carnival groups “the real protagonists” for their presence and for making the event possible. She congratulated the Kiessling family too for winning TripAdvisor’s 2018 Travellers Choice Award for the second year in a row. “I recently read that there are almost 50 million people who have visited the Park and, therefore, 50 million who also visit our tourist city and can share their experience with everyone”. “This is an event that I am convinced will continue to grow. It’s important to take advantage of the good tourist period that we are going through to consolidate these initiatives that help to differentiate our offer and allows us to promote a very diverse cultural and leisure agenda throughout the year,” added the Councillor for Tourism. In addition, Luis Durango, Communication Director of the Compañía Cervecera de Canarias, highlighted the link between the Dorada brand and the Carnival, and wanted to underline his hopes for their continued participation in future editions of this festivity. 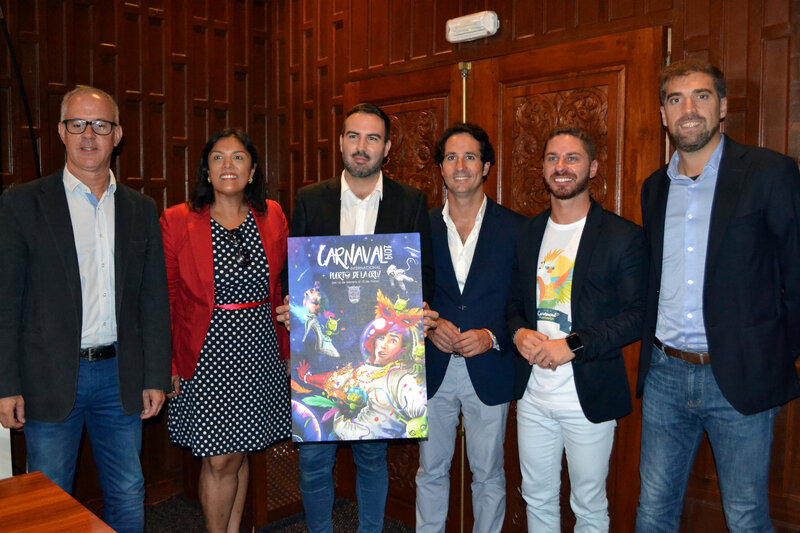 Puerto de la Cruz’s Summer Carnival also counts on the support of the Urban Consortium for the Rehabilitation of Puerto de la Cruz, which since its beginnings has encouraged this initiative that energises the city. The formal act of presentation kicks off a weekend full of life and colour that will continue to the frenetic rhythm of Carnival. Avenida Colón, Paseo San Telmo and the Plaza de Europa will be the main centres where the different events will take place, which will end next Sunday, September 16, with the performance of the fanfarrias (drum and cornet bands). With the condition of sick orca J50 growing increasingly dire, scientists are now considering a last-ditch plan to capture the emaciated killer whale for treatment. “Most of us think J50 is really sick,” Vancouver Aquarium head veterinarian Martin Haulena said. J50 has been dosed with antibiotics and anti-worming medication but so far efforts to treat her have been unsuccessful and they’ve noted a decline in her condition over the last month. So now, if the whale gets separated from her pod or gets stranded on a beach, a plan is being discussed to take her into captivity so she can be fed and given intensive medical treatment. 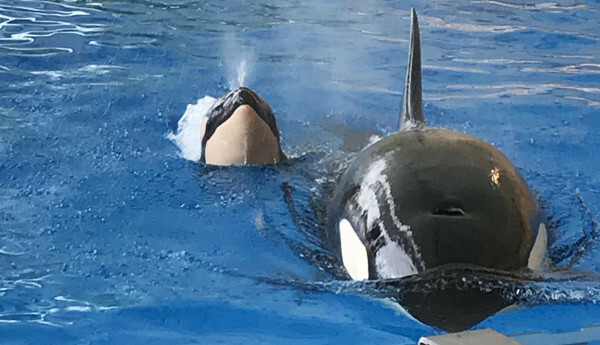 While veterinarians know such a move would be controversial, they say the other option is to let the whale die, which would be a major setback for the population of just 75 remaining resident orcas.